From the purple Perigord to the black Perigord, discover a rich prehistorical heritage. You enjoy refined local cuisine. Lovers of history and nature-sculpted spaces, hop on your bike to explore Dordogne. In the Vézère and Dordogne valleys, small roads take you to castles, rupestrian painted caves, troglodyte villages, forests and vineyards. Enjoy the liveliness of historic towns and quiet of the countryside and itineraries. Périgord is a varied and hilly region we recommend you cycle through. The Green Périgord, up north, is named after the forest, grassland and agricultural land that cover the region. A granitic country, it is geologically a part of the Massif Central. The White Périgord, country of Ribérac and Périgueux, refers to the limestone in the region, in the center of Périgord. It is also known as Périgord’s granary for its cereal plains. 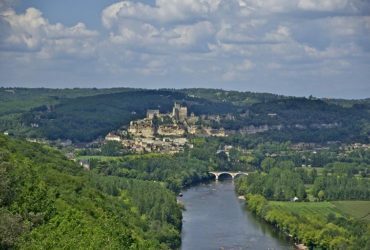 The Black Périgord, in the southeast, is the best known. The region of Sarlat la Canéda is characterized by immense dark oak forests which gave the black color. 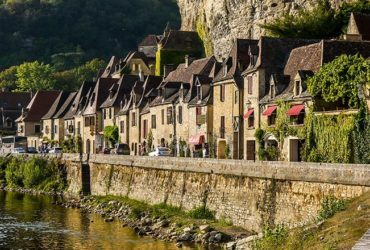 The Dordogne and Vézère valleys offer an exceptional density of medieval castles, prehistoric and troglodyte sites and villages classified among the most beautiful in France. 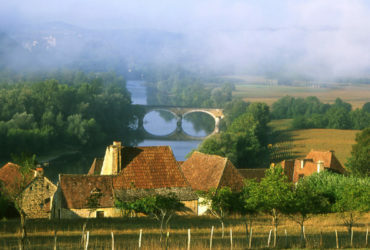 The Purple Périgord is named after its noble vineyards. Bergerac, straddling the Dordogne is the capital. Vineyards border it in the south, east and west. Monbazillac and Pécharmant wines, the pride of the region, have nothing to envy the neighboring Bordeaux wines. Dordogne has many historical villages. Connected by an important secondary road network they make it a beautiful region to cycle through! You will enjoy these small roads among valleys and hills, taking you to vineyard, forests, manors and castles. Prehistoric men probably chose to settle in the fertile lands of the Dordogne Valley for the climate, as it is pleasant all year round. Winters are mild even if it is not unusual to see snow. Spring offers more rain yet temperatures are pleasant for cycling. Summers are hot, with peak of temperatures that can go above 35°C (95°F)! We would avoid going there in August. It is the busiest month and prices are at their highest! Prefer traveling in September and October. These quieter months offer quite a lot of sunshine and ideal temperatures for cycling. Monbazillac, a castle, a vineyard and a great quality sweet white wine, a delicacy. Les Eyzies-de-Tayac, the world capital of prehistory with beautiful rock caves and a museum dedicated to prehistoric men. The Village of Sarlat La Canéda, a medieval architectural jewel. You can wander and get lost in its streets. As it is one of your stop for the night you will enjoy one of the beautiful restaurant terraces after a great cycling day. 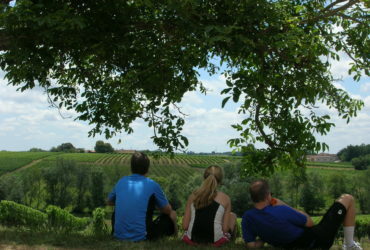 The villages of Domme and Belvès require some physical effort to reach, but the reward is worth the effort! The Dordogne and Vézère rivers where you can swim and enjoy a canoe ride! It is one of those destinations where you can cultivate yourself and rest under the midday sun. It is a good place to live in. The light will fill you up with positive energy, and gastronomy enchant you. Famous for its foie gras production, restaurant chefs prepare and serve it in all forms, classic to the most original versions. You can accompany these dishes with local wines that combine perfectly with it ! Moderatley of course ! The bike will do the rest!